Basic Membership includes our award-winning Technical Support Magazine (electronic format) plus numerous other benefits. Basic Members enjoy discounts on a broad range of products and services including technical books, a FREE NaSPA Thrift Benefits prescription card, and more. Members receive preference in publishing for our magazine – see the advertising section for more details. Of course, Members can access our extraordinary EMPLOYMENT WEBSITE for free. Finally, we will e-mail you a handsome membership certificate that you can display in your office as a proud NaSPA Member and supporter. 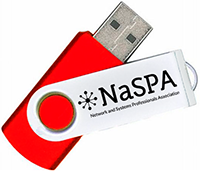 NOTE: NaSPA has a huge website repository of over 4000 articles dating back to 1987 and a vast software repository of patches, shortcuts, programs, games, and other items. Member Access to these and other services is NOT included in this membership tier and is available only to NaSPA Full Voting Members. If you wish to access these materials you will need to consider the NaSPA Full Voting Membership of $96.00 a year. Basic Membership: $24.00 / Yr.